I found a way to save money on cat food. I don’t know why I did not try this before since it is so simple. My method does not involve any tricks, hacks, or anything difficult. Read on to find out how I will save money on cat food. I have a pet cat and she means the world to me. To that end I will spend whatever it takes to make her comfortable. 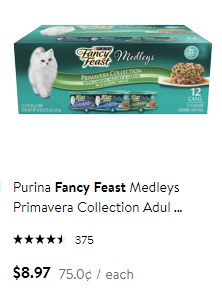 In the past I bought Fancy Feast Medleys. This cost 75 cents per can online. In the store the price comes to 79 cents per can. I thought I was able to save by ordering online and then doing the in store pickup when I bought fresh fruit and bread. 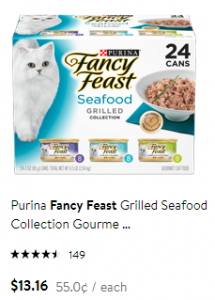 Now I will buy Fancy Feast grilled food. This costs 55 cents per can..which is a significant savings over the 75 cent per can food. I do not feel this is a downgrade in the food because the ingredients are similar and it is from the same brand. As much as I love my cat it is still important for me to save money where I can. That way I can spend in other areas, as long as I do not feel I have sacrificed the quality. What do you do to save money on cat food?